The e-pack of the 'Waves' sample is attached. The amplitude of the spectrum depends on the distance to the screen, so if the screen bends a little, then the spectrum will change accordingly. Then, we need a function that changes with time (frame). 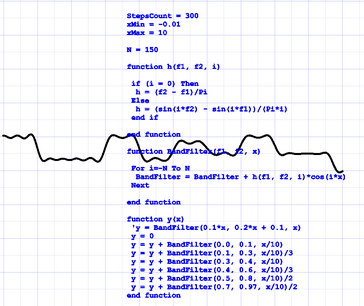 This function will set the spectrum amplitude at each point in time. For example, let it be the amplitude frequency response function of some bandpass filter. See file Waves_2D_profile.TCW. 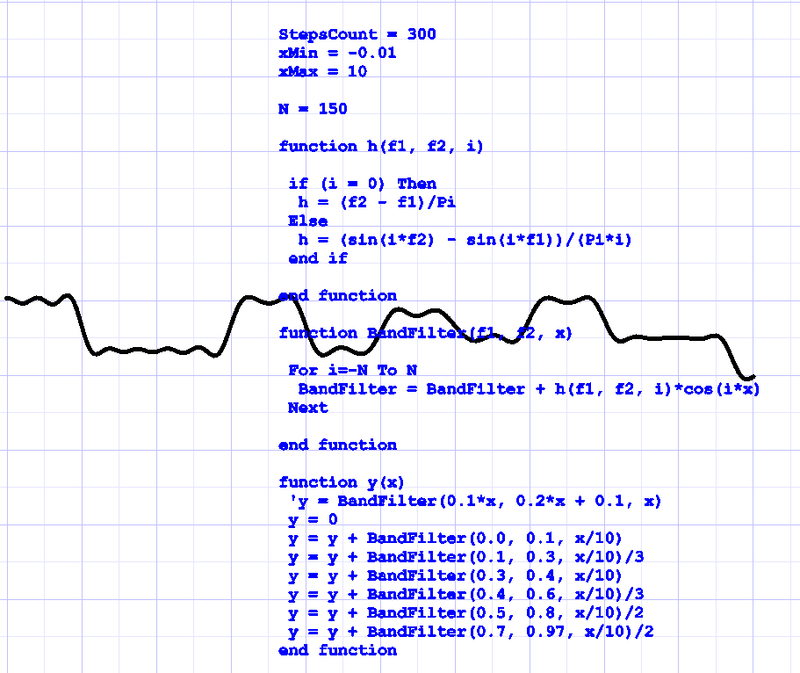 Let our function be similar to a sound signal (like a soundtrack fragment). See file Waves_Surface.TCW. Final result - our model operates according to a given law as a mechanical piano. Very interesting, and, much appreciated. Very nice work, thanks for posting Vlad. I must admit, I haven't heard the names CurveLab and SurfaceLab in a very long while (since I had v8/v9), and looking on the SoftDev site - plug-ins whilst the links are not working, one of the descriptions says TCv6.5, now that's going back a quite few years. Old versions CurveLab and SurfaceLab do not work for a long time. I rewrote a new version that works for all versions since version TCv19. Now these plug-ins are part of the project CadExp Task Palette. I showed to a few people. I hope that I am going to provide an pre-alpha version of CadExp Task Palette for discussion and testing. The tool, which allows building 2D, 3D graphics (Line, Curve, DblLine, MultiLine, Extrude, 3D polyline) using the formulas defined by user. The equations can be defined in evident way y=y(x) as well as in parametric x=x(t), y(t), z(t). There is a possibility to build parametric sets of curves. The user can control the number of steps, raising of pen (PenUp), and also use if..else operators, etc., which in principle allows building any curve if there is an algorithm. The tool, which allows building TC Surface graphics using the formulas defined by user. The equations can be defined in evident way z(x, y) as well as in parametric x=x(u, v), y(u, v), z(u, v). Also the user can control the surface smoothness. Surface Lab is interesting, the surface is a quad grid instead of the nurb surface that surface-by-law produces, is that right? Is CurveLab output polyline, like the old ScriptsPack CurveLab? Yes. For example - Waves_Surface.TCW (above). CurveLab output polyline, like the old ScriptsPack CurveLab? In fact, it can be any 2D/3D graphic with vertices. Really neat stuff, thanks for showing Vlad. My main drawback is I'm not good with maths formulas , but I can learn.